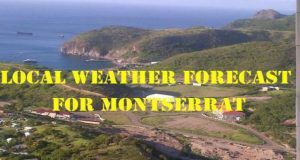 SYNOPSIS: A surface to low-level high-pressure system, in the vicinity, will continue to inhibit shower activity. WEATHER TODAY: Partly sunny with 20 percent or a slight chance of showers. WEATHER TONIGHT: Partly cloudy with 40 percent or a moderate chance of showers. WINDS: East-northeast at 22 to 37 km/h or 12 to 20 knots, gusting at times to around 52 km/h or 28 knots. SEAS: 1.5 to 2 metres or 5 to 7 feet and building. A small craft caution remains in effect and will likely be upgraded to a small craft advisory by tomorrow. Sunset today: 6:14 pm. Sunrise tomorrow: 6:32 am. 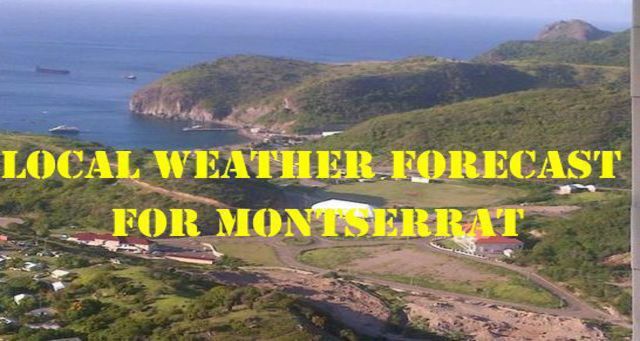 LOW: 22 °C/72 ° FPlease continue to monitor DMCA ’s facebook page -Montserrat Disaster Management Coordination Agency -DMCA and website – www.dmca.gov.msand ZJB Radio Montserrat for regular updates.